Dies R Us: Love & Happiness! Can you believe June is only a few days away? And, of course, June is traditionally a month for brides! Keeping that in mind, I had to share a wedding card today. With the multitude of amazing dies available at Dies R Us, you can create gorgeous wedding cards in just minutes! 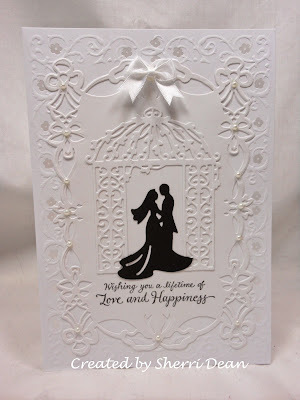 The beautiful card I will share today was created with just 3 dies! I used Die-Versions Whispers Wedding Canopy, Die-Versions Whispers Garden Gazebo & Spellbinders Bow Elegance. I normally use a plain white card for my base, but I had a package of gorgeous Recollections brand cards I bought on sale at Michaels. They have an embossed frame edge and as you can see, they were the perfect base for my beautiful dies. A small bow and some pearls were the only embellishments I needed to add. If you are wondering where I got my wedding couple, I simply made a couple of cuts to the beautiful Wedding Canopy die and slipped the couple from beneath the canopy. Never be afraid to use just portions of your dies as it gives you so many more options! For instance, the beautiful canopy in the original die also has two topiary trees which you could cut out to use beside your window or door dies! Don't forget to check out the daily and challenge blogs! And if you haven't been to the store since last week, you will want to check it out again! We are adding new products daily!! See you again next week! Go create something wonderful!